The Hobbit: An Unexpected Journey was hyped from the moment the last LOTR movie finished filming. It was inevitable. Of course, I am happy Peter Jackson committed to this project. He’s sees Middle Earth like no other. The movie was beautiful. The scene filmed on New Zealand country side were epic and Jackson utilized the natural beauty so well in the movie. It was comforting to see some cameo’s from LOTR such as Old Bilbo, Saruman, Galadriel, Elrond and the greatness that is Frodo. I liked the movie more because of the franchise and some residual good vibes from the LOTR, but it was slow at times. 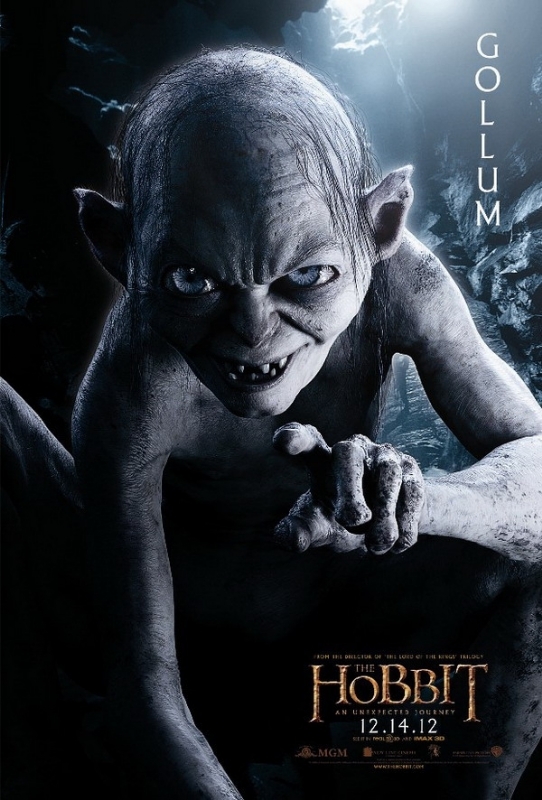 But, from the moment Gollum makes an appearance, until the end, the movie is amazing. 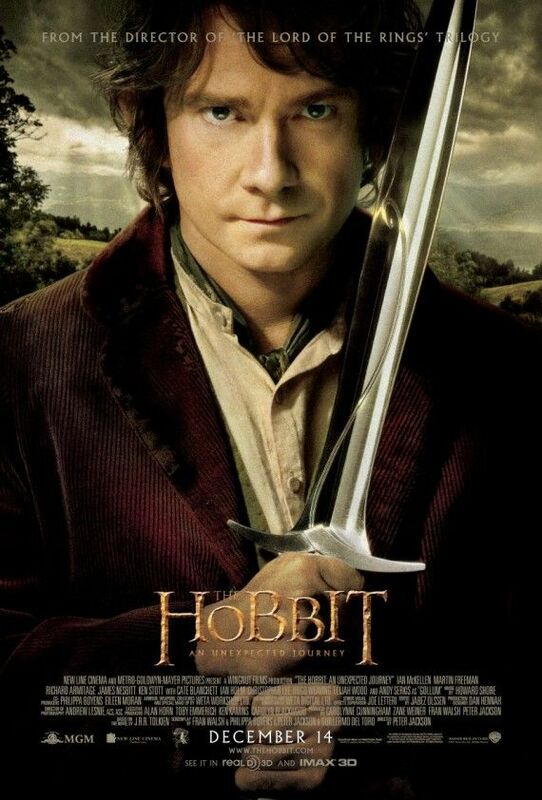 My favorite scene in the movie was the same as in the book; the riddle scene between Bilbo and Gollum. A contest alert: Guess the answers to the riddles? Leave the answers in the comments. Whoever answers the most correct, wins a $10 Amazon gift card from me. Come back on Sunday for the answers. And, go see the movie and read the book. Seen the movie so I know the answers! You nailed it – a little slow but comfortable and beautiful. That was my review as well. You can still participate. Because of the final scenes I am look more forward to the other movies. Thanks for the link love, feel free to also add your own caption if you haven’t yet. I know, I didn’t get the riddles until I had time to study them a little. Great scene. I loved these riddles! So much that when we watched The Hobbit, I was mouthing them along with the characters. I can’t wait to see the spiders in the next one … and Smaug, but I’m guessing they’ll wait until the last movie to so his awesomeness. And Gollum was even better in this movie then the other three. Gollum was so great in this. When his eyes turn blue, he is almost adorable. haha. Is it wrong that I enjoy the movie’s flow somewhat more than the book’s? The tone seems completely different between the two–the book is more tongue-in-cheek humor with a seemingly omnipotent narrator while the movie is a bit more serious with clearer motivations for its characters. Maybe it’s just me. I can agree with the slow at times observation though. Oh, and Gollum had me laughing once again. The book was funny to me with the the way they used he did the narration. The narrator addressing me the reader directly was kind of amusing. The movie was definitely more serious. And, some of the scary parts in the movie seem like major plot points where as in the book it was only a small mention. I haven’t read LOTR so maybe there is a reason in those books. And, we get to see more of what Gandalf was up to when he wasn’t with the group. I was happy I read the book first. Thanks for commenting Mike. I’m afraid I thought that the movie absolutely sucked. I’m talking deep-down, toilet bowl flushing in the heart of a thousand black holes sucked. I thought it sucked so bad that I was tempted to ask for my money back. In fact – to be blunt – I just didn’t care for it at all. Hey Steve, tell me how you really feel about it. HAHA. You going to give the other two a chance or are you done? Both my wife and I loved the original trilogy enough to say that YES – we will both probably drag our butts to the next two parts – thus encouraging the madness. Ooh, riddles are so not my thing! I STILL haven’t seen this and am dying. I can’t wait! It’s good, but I have a feeling the next two are going to be better. OMG, I loved Legolas. He was so pretty. When they went to Elfin Village in the movie I keep looking for him. Haha. You are showing amazing restraint. I couldn’t wait that long. I agree with Tameri–I have learned the hard way about seeing one, waiting for the next, then the next. Several friends have agree to also wait and then we’ll do a marathon viewing. But after reading the riddles, I don’t know if I can wait. Hi Andi-Roo, I should have waited until the dollar theater, but am excited about the rest of the trilogy as a whole because of how the 1st one ended. Yeah, no way could I have waited until they all come out.